I keep asking the question about joy in a variety of ways. Why? Because being engaged in life in ways that create joy create wellbeing. The questions, “How do I increase joy in my life? How do I create a sense of wonder daily?” are more important than you might think. One way I create joy is to create an intention to follow my bliss. The intention is key, as sometimes we hit the mark and do exactly what we hope to do and sometimes we don’t. More on that later. Joseph Campbell made the statement “follow your bliss” famous. Totally radical at the time, still radical. bliss (blĭs) n. 1. Extreme happiness; ecstasy. 2. The ecstasy of salvation; spiritual joy. Phrasal Verb: bliss out Slang. To go into a state of ecstasy. The definition by Merriam-Webster defines bliss as 1. complete happiness; 2. paradise, heaven. Bliss takes many forms. Looking out on a beautiful vista…oh Yeah! That is bliss. 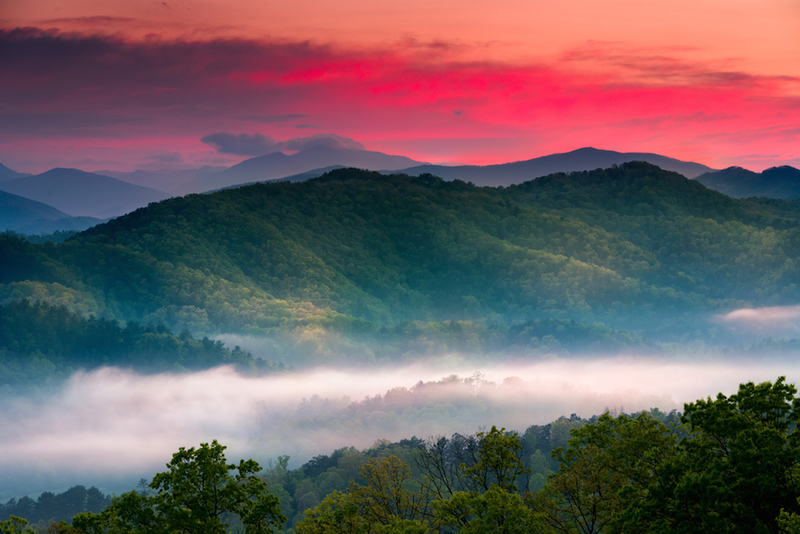 I chose the picture above for its colors and the movement of white mists in the valley. Life in motion. Looking at it brings me joy. But I can not always wake up in the great Smokies. Nor, with the best intentions do I always keep focus on finding joy. Yet the more I set the intention, the more clear a path do I find. As I have contemplated the question of what brings me joy or “bliss” I know it comes in many forms. What makes me truly happy is the peace of my own backyard, the verdant green grass and robin’s egg blue sky, being one with beauty of any kind, the quiet and peace within. Experiencing bliss often takes me by surprise – it is not a planned thing. It happens when we are each really present to one another. When I experience being with my children and grandchildren, laughing and playing, reading, snoozing, being together – in the zone – that is magical. When my grandson Benjamin was between the ages of 3 and 7 years old, and he would spend the night with us we always closed the evening with a story. Most of our stories I made up as we went along, generally tapping into an experience he had during the time he was with us. When morning came around he wouldl not wake up easily. And so I would wake him up gently, wrapping him up in a cranberry fleece blanket and carry him out onto the back patio to “Greet the Day”. As the sun rose above the horizon with its pinks and purples I would whisper in his ear to listen to the sounds, the trill of a bird, the soft breeze rustling through the trees, the sounds of an early morning hoot owl coming home from a night of hunting. He awakened to the world around him, and as he did, I did. It was Bliss. These are just a few of the ways I bring joy into my daily life. The days I do it I feel centered and at peace no matter what comes my way. The days I don’t feel hectic and a bit on the crazy side. How can you bring joy into your life each day? Start your day in nature. Make time to commune with nature when you first wake up. Whether you live in the city or suburbs, it’s possible. Find a quiet spot you like. Wrap yourself in a soft, warm blanket, take your coffee or tea outside and be still. Listen to the sounds of the world waking up around you. Imagine yourself one with that sound. Be Still. Get up before everyone else does. Hitting the snooze button deprives you of time alone. You can rest or slowly wake up when you “Greet the Day”. Stop, take a breath and center yourself during the day. Regardless of how much you have to do, centering yourself before, during and after tasks creates attunement. If you don’t feel like the task is going the way it should be, check in with your body to see what’s really going on. Take time to notice what you want out of the process. If you are feeling out of balance, perhaps you are too rigid in the way you are interacting with the task at hand. Noticing where you are in space and time fosters creativity and satisfaction. Take time to notice. Take motion breaks. If you work at a computer get up and stretch every 20 – 30 minutes. Set the timer on your phone and respond when the timer chimes. Welcome interruptions. Shift your attitude changing the idea of an interruption as a negative to a “little gift”. Changing pace can create new vibrancy in what you are doing and create a richer experience all the way around. Let every interaction with another be a gift. Speak gently, notice beauty in others and acknowledge it, show your appreciation to others regularly. What can you do or do you do already to create joy in your life? I would love to hear your thoughts and ideas, and hear about habits you have adopted that have made a difference. Do you struggle with creating habits that support peace and harmony? I welcome hearing your struggles in holding your intentions too. Sometimes all it takes is opening a conversation to renew our focus.